Did you know? Habitat for Humanity of Northwest Connecticut has over 11,000 square feet of retail space filled with treasures ready for a new home. 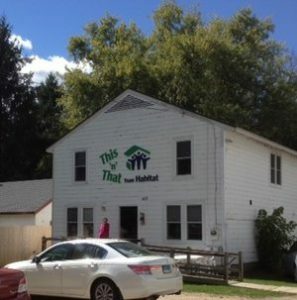 This ‘n’ That from Habitat helps support the Habitat mission and is the major source of funding for the local affiliate. Small item donations must be in a box with a closed lid (for stacking purposes). If you are planning to drop off a significant amount of items or heavy items (e.g., furniture) please call ahead to make arrangements. We need to make sure we have the space to accommodate these items. Appliances will continue to be picked up promptly, without costs. In June and July furniture pickups will be destined for Hotchkiss School for our Annual Tag Sale and picked up in late July, unless exceptions made. Charges: Pickups made within 12 mile radius of the Store will be subject to a $10 service charge. $20 beyond 12 mile radius. Check out our Retail Showroom – the Annex! The Annex is located opposite the main This ‘n’ That building, directly in front of “the barn”. Check it out – many “rooms” set up to beautifully display the furniture we have available for purchase. If you have any questions, please call the Store at 860-824-9839.